Serving Ottawa & Surrounding Area for over 45 Years! This is where it all began: Top Hat opened its doors as a chimney cleaning service in 1974. While our business has expanded into many other home comfort services, we honour those roots by continuing to provide the very best in chimney cleaning service. Over more than four decades, we have cleaned and serviced thousands of chimneys and appliances. Chimney cleaning may seem like a simple task, but it takes a great deal of technical know-how to also ensure that the chimney, and fireplace or stove, are in safe working order. Our chimney cleaning technicians are Wood Energy Technology Transfer (WETT) trained, and are experienced in cleaning all forms of wood and pellet burning appliances. 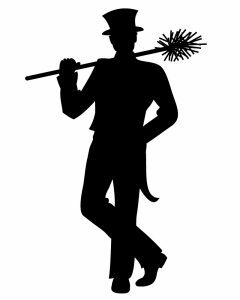 Top Hat is one of the few chimney cleaning companies in Ottawa, Carleton Place and the Valley that use a two-person team to perform our cleanings and inspections. This may cost a little more, but ensuring that all cleanings are done safely and to a high quality standard is our top priority. A complimentary 16 point report on the condition of your wood or pellet burning system is included with all of our standard chimney cleanings. If you need something more comprehensive, our crews can also perform a WETT inspection or provide other chimney maintenance and repair services. When our chimney cleaners arrive at your home, they will do a safety assessment to ensure it is safe to clean the chimney. The chimney cleaning is usually done from the top down. However, in some cases there may be a concern over safe access to the roof or chimney, or weather may pose a risk. In these circumstances, although it may take a little longer, we will perform a complete chimney cleaning from inside. Our chimney sweeps will need full access to your fireplace so they can close it off to ensure no ash or soot will come into your home as they do the chimney cleaning. Floor protection is put in place, and our specialized high powered chimney cleaning vacuum and other tools are set up. This specialized vacuum is equipped with a very fine filter to ensure no soot dust enters the home as the chimney cleaning is being done. While one of our chimney sweeps is setting up inside your home, our other chimney sweep is outside setting up our ladder to access the top of the chimney and bringing all the tools, brushes and chimney rods needed to the top of the chimney. When both chimney sweeps are ready, the chimney cleaning begins. With the damper closed and the specialized vacuum running, the team works together to sweep each section of the chimney until the entire length of the chimney is cleaned. When the chimney is clean, they move on to cleaning the interior firebox, damper and smoke shelf with a hand brush and the high powered chimney vacuum. While performing the cleaning, both technicians inspect and make notes on the condition of the chimney and appliance, to be included in your complimentary 16 point report. If they detect any problems or issues that would affect your safety or efficient operation of the appliance, they will explain the issues and recommend potential solutions we can provide. 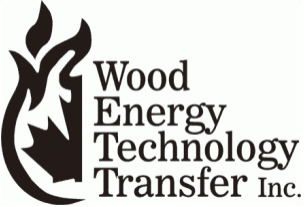 A Wood Energy Technology Transfer (WETT) inspection is a more comprehensive inspection of your solid fuel system, which goes above and beyond the complimentary 16 point inspection mentioned above. In the Ottawa Valley and Carleton Place areas, WETT Inspections are most often requested by a third party, such as a prospective home buyer or insurance companies who may request periodic WETT inspections to maintain coverage. We can have one of our WETT technicians perform a certified inspection to detail the condition of your system, with measurements of all required clearances and safety requirements. This is a “Level 2” WETT inspection. When looking for a WETT Inspection, be sure that it covers the system adequately to identify potential issues. See the here for WETT Inspection Levels, and what they cover. A periodic in-depth WETT inspection can provide a great deal of peace of mind, reassuring you that everything is safe and in good condition. How Often Does Your Chimney Need To Be Cleaned? • how well your chimney drafts. For most homes, an annual chimney cleaning is a good place to start. Our chimney sweeps will be able tell you whether you have gone too long between cleanings, and can recommend an appropriate schedule..
Every flue should have a rain cap, even if the chimney is not in use. The rain cap prevents most rain and snow from entering your chimney flue and potentially causing damage over time. 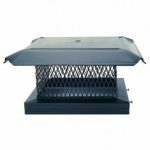 Our rain caps are screened in, so they also prevent birds and other wildlife from entering and creating blockages in your chimney. Top Hat’s trucks are stocked with the most common sizes of chimney rain caps, and we can order in a wide variety of speciality and decorative caps at your request. One of the most common chimney repairs we find when performing a chimney cleaning is the need to replace a chimney’s chase cap. This is the covering for the chimney that surrounds the flue at the top of the chimney and protects the interior structure of the chimney from rain. The chase caps we install require us to take measurements; the chase caps are then custom built from metal flashing, with many colours to choose from to match the aesthetic of your home. We provide free estimates for this type of repair. A simple solution to a sometimes complex problem. Fireplace chimneys can be a significant source of energy loss from your home. A lock-top damper system completely seals your chimney from the top when it’s not in use. 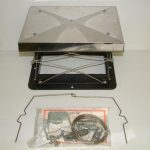 The Lyemance top sealing fireplace damper reduces heat and air conditioning loss, and eliminates down drafts when your fireplace is not in use. Closing the top of the chimney also eliminates the risk of birds or other animals making a home in your chimney. In addittion, the lock top damper keeps the interior of the chimney a little warmer, so when you go to light a fire, you will have less trouble establishing a proper draft. Our chimney sweeps can also perform maintenance and repairs to your wood stove or fireplace. The most common items that should be checked are the gaskets that seal around the glass and doors. These are often overlooked, as it is not always easy to tell when they need replacement. A door gasket should be replaced once there are gaps that remain while the door is closed. 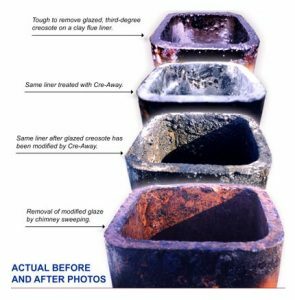 Our chimney sweeps can identify such issues during their inspection, while cleaning the chimney. 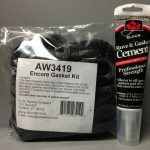 They will let you know if it’s time to have the gasket changed, and can do the replacement for you as well. Other items that may need repair include fire bricks, and brackets. Many newer stoves & fireplaces may also have secondary clean burning systems that may include baffles, tubes, or in some cases catalytic combustion components, which require periodic replacement. Our chimney sweeps will be able to advise you which components apply to your unit. 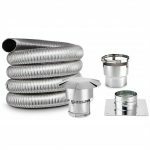 Stainless steel or aluminium chimney liners are often a good remedy where a masonry chimney has minor interior damage or deterioration, provided the exterior and structure are sound. Chimney liners are required for gas, wood or pellet inserts, while wood stoves venting through a masonry chimney don’t require a liner, as long as the interior tile lining is in good shape. Newer high efficiency wood stoves, however, will function much better if a liner is installed. Over the past 20 years, the use of prefabricated fireplaces and chimneys has become far more popular. These chimneys can be installed in almost any situation, and can be used to vent wood, pellet, or gas appliances. We service and repair almost any brand of prefabricated chimney. Our high efficiency fireplaces and stoves are designed to operate with prefabricated metal. Whether you need a chimney inspection, install, or repair, we can help. 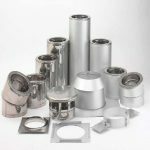 We sell and install chimneys from several manufacturers, such as ICC and Security. If you have noticed mortar loosening between the bricks of your chimney, pieces of clay liner or brick on the ground, chimney down drafting, or discoloration of your chimney, visit our Masonry department page. Top Hat provides emergency service for blocked flues for all types of chimneys, including those for gas and oil furnaces. If you have a blocked chimney or a no heat situation, call our Emergency Services any time of day or night at 613-722-1226. 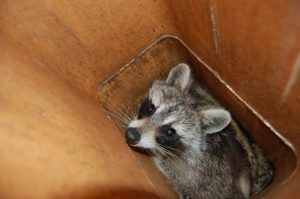 If there are live animals in your chimney, we recommend contacting Skedaddle Humane Wildlife Control online, or at 888-592-0387. For more information on our Chimney Cleaning and maintenance services, or to book an appointment please call us at 613-722-1226. You can also email us at info@tophathomecomfort.com, or fill out our online consultation request form and one of our chimney professionals will be pleased to assist you.